Of all the people I have met in my life, few compare with Steve M.
I met Steve over 20 years ago, when they were doing a radio show, called RadioHope. Steve was in Phoenix, and I was living in Southern California at the time. We corresponded for years. At last I had found a kindred spirit. God brings people into our lives for a purpose. Fundamentally, he transformed me and my ministry. I used to hang out with the metalhead crowd. As I got to know Steve, I discovered he had compassion for the outcasts of society: the punkers, goths, skaters, cutters, homeless, elderly. Anyone whom God put into his life. Steve grew up in Arizona, but would spend time visiting a small town in Minnesota, where his family and my friend Cyndi now lives. I never knew a lot of Steve’s past. But you could tell from his writings, especially poetry, (see Outcast Press ) that he was no stranger to pain, suffering, or brokenness. Complaining is definitely something that was NOT part of his essential nature. Reaching people with the gospel, was his goal. At the centre of his existence, you would find an Evangelist. One who well understood the human condition, and one who would take the time to build a genuine relation with someone. If I had only two words to describe Steve, one would be hopeful. If you travel around Phoenix, Tucson, or any town that he visited, he did what he called an art installation. He infused hope wherever he went. He would bring healing art (Dia de los Muertos style) to the homeless. 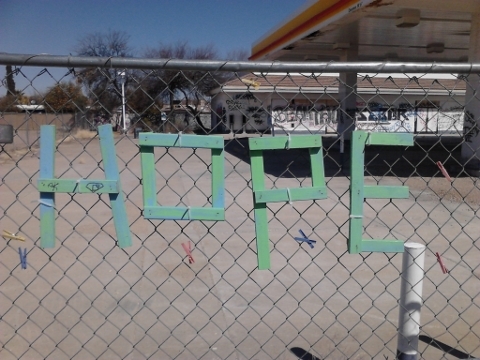 If you see the word “HOPE” on a fence or by way, you knew he had been there. The other word that describes Steve, is humble. Steve was not ostentatious, and his only penchant in life, seemed to be sports du jour. He loved to watch a good game on TV with his family. Steve had the right balance between ministry and home. A value he passed on to his sons. 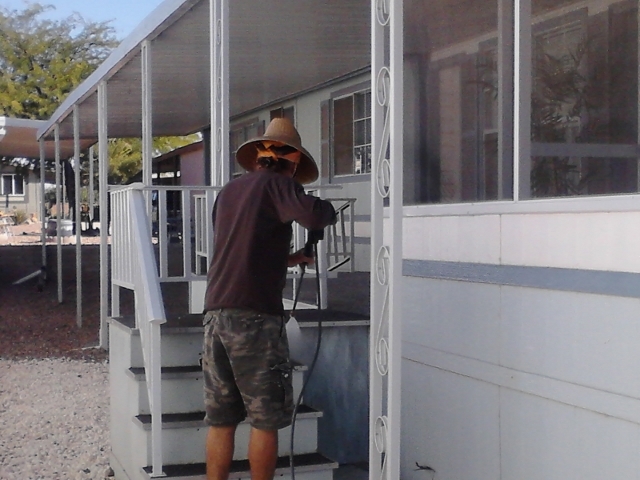 For me personally, he was the one who painted my new home. I was privileged to have him as a friend, a kindred spirit, and a fellow shadow dweller. I will always remember his contentment in life, his dedication to God and his family, and his spirit, which made all men yearn for the Creator of the universe. See you in Heaven, old friend. that perches in our soul.